ArchVision releases new content just in time for the new year. 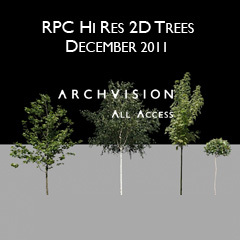 RPC All Access plan customers now have access to a new library of Rich Photorealistic Content (RPC) from ArchVision. This RPC collection features American Sycamore, Topiary Deciduous , Variegated Norway Maple and White Birch . Check out the latest RPC Content added to the RPC Content exchange by clicking recently added from ArchVision Dashboard. ArchVision Dashboard is available as a free download and provides users a free trial.